While Jeff Mangum began dusting off Neutral Milk Hotel hits on his recent solo tours, it's now been revealed that the quirky indie songsmith is getting the band back together for a handful of reunion dates. 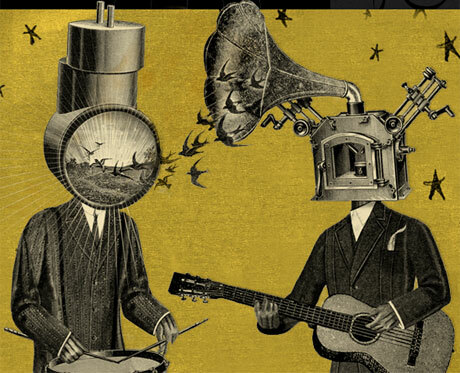 These will be the first proper Neutral Milk Hotel shows in 15 years. Granted, the band's current itinerary is pretty tiny, and so far no shows take place in Canada, but it's been confirmed that Mangum and old pals Jeremy Barnes, Scott Spillane and Julian Koster will take the stage together this fall. This includes two hometown shows in Athens, GA; a stop in Asheville, NC; and a couple overseas festival appearances. Don't fret just yet if you can't book a flight out to any of the performances, as the band report that there are "more to come." Here's a statement from the band regarding the announcement (enjoy making sense of it): "and of water course womb rume is a wandering the welkin woman whose fune caul is all umbilical cord code that comes equipped with read volve vît curtains that čun seel my văl én tich radio reason in remembrance of mademoiselle gabrielle and her wone tym pad lock of burd language as it borders on twin tolk the wolk king wall of woolpack pigeons pointing to the fly blind readers riddle and his rian boh"
The last official Neutral Milk Hotel performances took place late in 1998, following the release of the outfit's much-acclaimed sophomore LP In the Aeroplane Over the Sea.